Literature: Dorinda Evans, Mather Brown, 1982, p. 221, Catalogue raisonné no. 140 (as whereabouts unknown). The author dates the painting circa 1790 and notes the sitter's name as a pseudonym for John Williams. John Williams [pseud. Anthony Pasquin] (1754–1818), satirist and historian of Irish art, was born on 26 January 1754 in London. His father was Benjamin Williams, perhaps the corn factor of that name in Southwark in the 1760s. If he was the John Williams, son of Benjamin, baptised at St Leonard, Shoreditch, on 17 February 1754, his mother's name was Ann. He was educated between 1762 and 1768 at Merchant Taylors' School, where he wrote his earliest verses (satirical Latin and sentimental English) and was much influenced by the headmaster, James Townley, friend of Garrick and associate of Hogarth. Williams then studied engraving under the engraver and caricaturist Matthew Darly in the Strand before entering himself as a student in the Royal Academy Schools on 6 December 1773. His sentimental novel The Curate of Elmwood was serialized in the Westminster Magazine (January–March 1773). 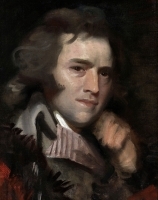 He exhibited engravings and drawings at the Society of Arts and the Royal Academy between 1770 and 1775, after which his activities are unrecorded until 1780 when he was an itinerant portrait painter for three years in Ireland until 1783. Early in 1784 his comedy The Unfortunate Beau, adapted from Christopher Bullock's Woman's a Riddle, was acted in Dublin and his pro-Catholic, anti-government articles, signed ‘Socrates’, were appearing in a radical Dublin newspaper, the Volunteer's Journal. The publisher of this paper, Mathew Carey, was charged with seditious libel and imprisoned in April 1784, but escaped to the United States, while Williams withdrew to London, where he wrote for the Morning Herald until he violently quarrelled with its proprietor, ‘the fighting parson’ Henry Bate Dudley. Williams wrote theatre and art criticism for other journals and worked as a translator. He skirmished constantly with other reviewers. In 1786 Williams adopted the pen-name Anthony Pasquin and published his first extended satires on actors, in The Children of Thespis, a collection of verse portraits, and on artists, in the never staged and un-actable The Royal Academicians, a Farce; he also conducted his own unsuccessful weekly satirical review The Devil. Of these, only The Children of Thespis was profitable. Two more parts appeared in 1787 and 1788, and the thirteenth edition of the complete work was published in 1792. It was said that Williams used his reputation as a satirist to coerce ‘timid painters and performers, musical and theatrical’, into giving him and his friends free dinners and gratuities (Taylor, 276), and there is an account in his own hand of the sums, ranging from 10s. 6d. to £100, he received from those he had praised in The Children of Thespis. However, Williams's wit and sparkling conversation made him genuinely welcome in fashionable, if raffish, society. He passed ‘attic and luxuriant hours’ (Williams, Eccentricities, 1.313) with the convivial actor John Edwin, and was fellow rioter and salaried poet laureate of the wild, profligate, and short-lived Richard Barry, earl of Barrymore. Williams's rattling, anecdote-packed memoirs (1791 and 1793) of these two notorious men testify to friendship as well as catchpenny opportunism. His Treatise on the Game of Cribbage (1791) was another by-product of misspent hours. Williams's Poems in two volumes (1789) attracted over 700 subscribers, including a good sprinkling of English and Irish peers. The first volume contained verse tales, complimentary and occasional poems, and a few satires; the second was a new edition of The Children of Thespis with copious notes. His later verse was mostly satirical. His Postscript (1790) to Christopher Anstey's New Bath Guide was well received, perhaps because it was less politically contentious than, for instance, Williams's anti-clerical and anti-aristocratic Shrove Tuesday and Ode to Thomas Paine (1791) or his New Brighton Guide (1796), written ostensibly to justify the prince of Wales's ill conduct towards his wife, but highly critical of the prince's entourage. In 1795 Williams published a longer version of The Curate of Elmwood, a work from which he probably earned little because it was pirated (complete or abridged) and plagiarized at least a dozen times under various titles between 1773 and the 1820s, one version being attributed to a Mr McMillan. Though Williams's statement in 1797 that he had edited more periodicals than any man living is probably an exaggeration, there is no doubt that he was a busy journalist, both in short-lived periodicals launched by himself and in established newspapers, including the Morning Chronicle, then the leading whig organ under James Perry. Williams also wrote separately published anti-government prose pamphlets from the standpoint of a Foxite whig: these included Authentic Memoirs of Warren Hastings (1793), Legislative Biography (1795), and A Looking-Glass for the Royal Family (1797). He wrote art reviews in newspapers, separately published reviews of Royal Academy exhibitions, and critiques of individual artists in Memoirs of the Royal Academicians (1796). It is, however, his Authentic History (1796) of the artists of Ireland on which his modern reputation is founded, as it is the essential biographical source for its subjects, many of whose lives and works are otherwise unmemorialised. Strickland, whose Dictionary of Irish Artists (1913), which remains the Textus Receptus on the subject, relies throughout on information gleaned from the pages of Pasquin's Authentic History, His writings on politics and art alike appeared under the name of Anthony Pasquin. Several of his books were illustrated with frontispieces and vignettes drawn and/or engraved by him. Such versatility did not save Williams from poverty. His dedication of the later of his two versions of The Pin-Basket to the Children of Thespis (1797)—effectively a fourth part of his most popular verse satire—frenziedly berates Warren Hastings for not rewarding him for many years of journalistic support. Another sign of financial desperation and an unbalanced mind was Williams's decision to sue for libel forty booksellers who were selling a new edition of The Baviad and Maeviad (1797) in which his tory enemy William Gifford had vilified him. Williams, who claimed £1000 against each defendant, was represented by Thomas Erskine, successful former defender of Thomas Paine and other famous radicals. The trial was on 8 December 1797 before the expeditious lord chief justice Kenyon. Counsel for the defence, William Garrow, alluded darkly to Williams's own libels on respectable public figures, such as Edmund Burke and the prince of Wales, which were too offensive to read in court, at which point the judge intervened and advised the jury to nonsuit the plaintiff, which they immediately did. The trial took 90 minutes in all. It was said, probably correctly, that the jury was packed and the judge politically biased against Williams (Cobbett, cols. 327–9). Kenyon refused Erskine's application for a new trial and Williams fled to America to avoid the heavy legal expenses he had incurred. In New York he sought work in the theatre with little success, though a patriotic after-piece by him was performed in June 1798. Journalism hardly proved a more reliable resource. The weekly Columbian Gazette, edited and published by John Mason Williams, as he sometimes called himself in America, survived for only twelve numbers (April–June 1799) and exposed him to abuse from William Cobbett, the leading English tory journalist in America, who was at that time an enemy of Erskine and an ally of Gifford. That summer Williams became an itinerant painter again: portraits of Indian chiefs, drawn when he was touring near the Great Lakes in 1799, were exhibited at the Royal Academy in 1802. By the beginning of 1800 Williams was in Boston, where he wrote for the Columbian Phenix and republished The Curate of Elmwood. In 1802–3 he was in England, having perhaps compromised with his creditors. On the return voyage in October 1803 he lost everything, ‘except life itself’ in a storm off Madeira (Williams, Dramatic Censor, 282). Back in Boston, he was editor of the Boston Democrat for some months until, in June 1804, he quarrelled violently with his partners. Earlier in New York he had supported Alexander Hamilton and the Federalist Party; in Boston he changed sides, supported Jefferson and the democrats, and, within three months of Hamilton's death in June 1804, published a savage satire, The Hamiltoniad, or, An Extinguisher for the Royal Faction of New England by Anthony Pasquin. Williams returned to England, perhaps as early as 1806. He wrote art criticism for the Morning Herald in 1809–10, apparently having made his peace with Dudley, whose political views regarding the prince and princess of Wales coincided with his own, and, in 1811, published monthly theatre reviews in his own Dramatic Censor ‘by J. M. Williams, LL.D’. (There is no independent evidence that he had any university degree.) The collected Dramatic Censor (1812) was dedicated to Williams's last patron, the eccentric amateur actor Robert (‘Romeo’) Coates. In June 1814 Williams visited Paris, employed as a theatrical agent by Henry Harris, manager of Covent Garden Theatre, to search for plots, tricks, and artists for London pantomimes. The next, and last, trace of Williams was the, probably correct, report from America that he had died of typhus ‘in obscure lodgings and in very indigent circumstances’ at Brooklyn on 12 October 1818 (New York Evening Post, 16 Oct 1818), but his enemy John Taylor claimed in 1832 that this report was false and that Williams died ‘at an obscure village not far from London’ (Taylor, 279–8). In his day Williams rivalled Peter Pindar (John Wolcot) as a wit, but his literary reputation did not outlive him. He was boorish, arrogant, belligerent, and reputedly dirty. It is said that when he asked Lord Barrymore what disguise he should wear at a masquerade, the reply was ‘go in a clean shirt, Anthony, and nobody will know you’ (Bernard, 2.323); also that he ‘died of a cold caught by washing his face’ (Moore, 3.239). It is not known whether Williams was ever married; his writings show evidence of misogyny. Mather Brown (christened October 11, 1761–May 25, 1831) was a portrait and historical painter, born in Boston, Massachusetts but active in England. Brown was the son of Gawen and Elizabeth (Byles) Brown, and descended from the Rev. Increase Mather on his mother's side. He was taught by his aunt and around 1773 (age 12) became a pupil of Gilbert Stuart. He arrived in London in 1781 to further his training in Benjamin West's studio, entered the Royal Academy schools in 1782 with plans to be a miniature painter, and began to exhibit a year later. In 1784 he painted two religious paintings for the church of St Mary’s-in-the-Strand, which led Brown to found a partnership with the painter Daniel Orme for the commercialization of these and other works through exhibition and the sale of engravings. Among these were large paintings of scenes from English history, as well as scenes from Shakespeare's plays. However, despite their success he began to concentrate on portraiture. His first successes were with American sitters, among others his patron John Adams and family in 1784–85; this painting is now in the Boston Athenaeum. In 1785–86 he painted the first portrait of Thomas Jefferson, who was visiting London. He also painted Sir William Pepperrell. His 1788 full-length portrait of Prince Frederick Augustus in the uniform of Colonel of the Coldstream Guards led to appointment as History and Portrait Painter to the Prince, later the Duke of York and Albany. Other paintings include the Prince of Wales, later George IV (about 1789), Queen Charlotte, and Cornwallis. A self-portrait now belongs to the American Antiquarian Society, Worcester, Massachusetts. A falling off of patronage in the mid-1790s, and failure to be elected to the Royal Academy, led Brown to leave London in 1808 for Bath, Bristol, and Liverpool. 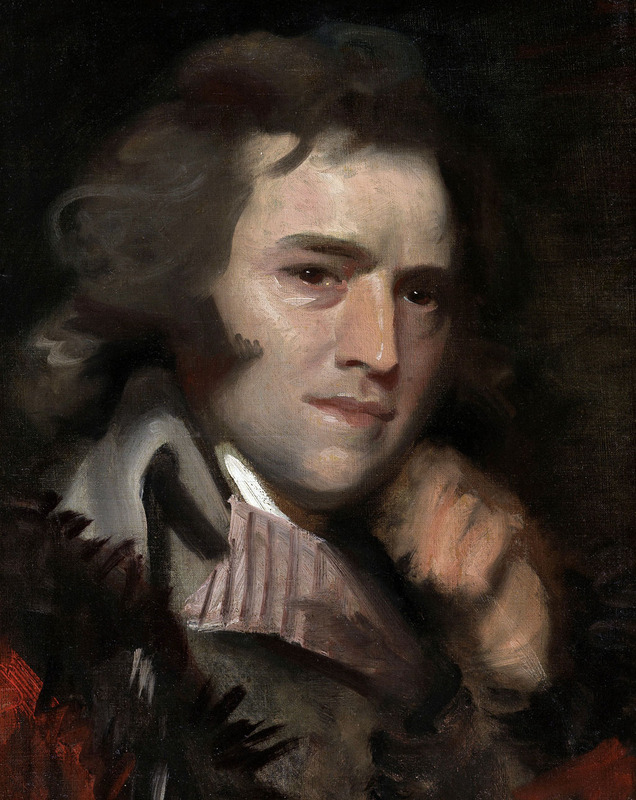 He settled in Manchester, returning to London almost two decades later, in 1824, where, even after West's death, he continued to imitate his teacher's style of painting. Unable to secure commissions, Brown eventually died in poverty in London on May 25, 1831.